When I first heard that TV-M7 got an upgrade, I thought it was the rating on the latest kid’s show. 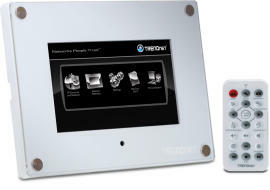 It turns out that the TV-M7 is Trendnet’s IP camera monitor and photo frame. For those of you who don’t know, it also turns out that the TV-M7 is part of Trendnet’s first-to-market seven-inch Wireless Internet Camera Monitor Kit, the TV-M7110WK. This set-up includes a wireless internet camera, the TV-IP110W. Both the IP Camera and monitor are connected to each other by a wireless network, which, according to my source, is a first in the business. The camera provides real-time coverage in M-JPEG format, with an easy-to-use mounting kit. It also features motion-detecting recording, e-mail alerts, as well as scheduled recording times. Not only is the monitor designed to connect to the wireless network and camera, but it can also act as photo frame that can play videos and music. Back to the upgrade on the TV-M7, the monitor has just received a feature that allows the user to customize their login screen. There is also a way to connect up to four cameras over the Internet. The Wireless Internet Camera Monitor Kit, aka TV-M7110WK, is about $450 and comes with a two-year limited warranty. The monitor on its own costs $275.